Everyone visiting Faerieland has their own favorite part of the city--be it the illustrious Hidden Tower, the kind-hearted discarded blue Grundo plushie, or other unnoticeable obscurities tucked into the vast forest kingdom. But on the more obvious, and less loved, side of Faerieland is a bluff belonging to one particularly snarky dark faerie. Jhudora has found a huge audience of Neopians in her most famous trait--giving out strenuous quests in exchange for a trinket of her own. In fact, this seems to be her only trait--Jhudora doesn't go around in a spaceship, doesn't fly around turning pets into random colors, doesn't wander around aimlessly healing pets' max hit points. But while no one knows what she is doing with all those Simple Red Side Tables, most suspect that she is up to no good. And for good reason as well! She is a dark faerie. Setting out to Faerieland after a quick(ish) stop at Hubert's Hot Dogs on behalf of the Neopian Times, I tracked down this suspicious faerie who has made her home right outside of Faerieland after being cast out of the city by the other faeries. Upon arriving, she demanded that I finish one of her quests in exchange for an interview. After hauling her a Simple Red Side Table all the way from the Neopian Bazaar, she gave me a small bottle of Noxious Nectar and allowed to sit for exactly fifteen minutes for a quick interview. Get to the chase, dummy. Do you want to leave here as your normal self or would you rather hop away as a Mortog? Uh... uh... okay, okay. What's behind all these quests? Other than poisoning those scraggly little Neopets with my poisonous rewards, nothing important. What do you mean, "am I sure"? Oh, you're just like silly Fyora over there in the palace. *waves arms around and speaks in mocking tone* Oh, Jhudora, you should really stop tricking the Neopians with all your prizes! Oh, Jhudora, what are we going to do about you? Jhudora, you must be plotting with Dr. Sloth to rule Neopia! Well, no! My purposes are purely personal. And on a second note, I despise that ridiculous green buffoon! Why would I want to be like him and take over Neopia? Preposterous! And also, just LOOK at that little pest Illusen! She does the exact thing I do--she hands out quests to Neopians in exchange for her little prizes! And here we don't see anyone going around accusing Illusen or kicking her out of Meridell? In fact, her quests have skimpy prizes! I mean, who wants a honey potion when you can have a dark shroom? It's discrimination against dark faeries, I tell you. D-I-S-crimination! Well, Jhudora. Why do you need Simple Red Side Tables anyways? I need furniture from imbeciles like you. Look, that side table is 600 neopoints in the Neohome Superstore. And the nectar I gave you was worth... what? 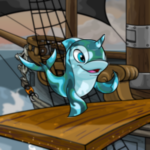 You're selling it for 10 neopoints in your shop! I saved 590 neopoints out of my own pocket delegating my silly tasks to you. And of course, handing out an avatar at the higher levels and promising my own personal faerie wand gets you stuck to my quests like a vernax is in a web. And that is why I cannot completely despise you Neopians--you're like my own personal Gruslen servants! 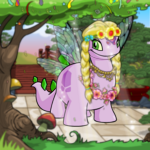 So, Jhudora... why don't you get along with the other faeries well? You want the whole truth? Nothing but the truth? *cackles* It's because they are too jealous of my radiant magnificence! Look into my eyes. What do you see? It's called power, fool! It makes everyone jealous! Jhudora, a more personal question. Do you like it better here on your... bluff, or up on your cloud? Well, for starters, bouncing around the clouds was fu-- I mean, uh, there's no difference. What about the "Jhudora's bluffing" joke? OH, GREAT FYORA NO. DON'T GET ME STARTED ON THAT. Eh... okay. So were you and Illusen ever friends? Will you ever be friends? *sighs* Go onto your next question, please. Want to explain the green streak in your hair? Doesn't it give me a bit of spice? After all, all the other dark faeries have plain purple hair. This here symbolizes power. And look! Look at these gorgeous robes. See how the green and purple complement each other? This here symbolizes a true sense of style. Nothing like that Delina. Fading purple hair, a ridiculous smile on her face, and not a bit of fashion sense. She is an annoying red blot on the portrait of dark faeries. Such a disgrace, that girl. She could be off terrorizing Tyrannians or infecting Fyora with a pox, but no! She's dancing around making Neopians idolize her through her flamboyant quests. It makes me infuriated just thinking about all the fun she's having--I mean, the disgrace she is bringing to the dark faeries! I will quote myself when I say that "just because you wear a pink gown, doesn't make you deserve the crown." I said it's pink, and pink it is! By the way, your fifteen minutes are nearly up and if you don't get out of here in 5.2 seconds, I am going to turn you into a Mortog. Wait, wait! Let me just get one more quote in. Tell us a closing statement, Jhudora! GET OUT OF HERE OR I WILL TURN YOU INTO A MORTOG DID YOU HEAR ME CORRECTLY. Thank you for your time, Jhudor--aaah! I'm going! I'm going! Disclaimer: the author did manage to avoid being turned into a Mortog and is now checked into the NeoHospital for treatment due to excessive shock and panic. Flowers are appreciated.